Learn how to rebuild and tune your carburetor for high performance racing or modify for better gas mileage (MPG). Ethanol resistant accelerator pump tuning, carburetor throttle shaft bushings, rebuild kits and marine applications are some of the subjects covered. 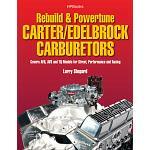 DIYers learn technical info from professionals on carburetors such as Rocester Quadrajets, Holley and Carter. Great technical information.